“As the marijuana industry continues to grow, the federal-state conflict in cannabis laws is causing marketing problems for companies within the industry. 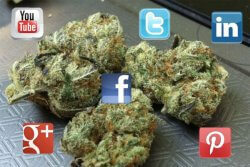 Marijuana businesses routinely have their Facebook ads rejected and their Instagram accounts shut down ― ostensibly for violating the services’ policies against promoting illicit drugs. Unfortunately, this happens over and over in the cannabis space will little consistency across companies, and I am afraid that it will continue to happen until we can see some significant national-level policy change. How do we make national-level policy change happen? I am so glad you asked! The answer is GET INVOLVED. If you are a business, become a member of the National Cannabis Industry Association which is working in Washington, DC to repeal federal prohibition. If you are a student or have young people in your life, support Students for Sensible Drug Policy. And of course, if you want to be informed of the latest political, technological, and other challenges for businesses in the cannabis industry, go to the International Cannabis Business Conference! Our next stop is paradise on December 1-3 in Kauai, Hawaii, followed by San Francisco in February, Berlin in April and Vancouver, BC, set for next June. Tickets are on sale now! Photo courtesy of Blogtrepreneur via flikr.